Instructional Designer from the Seattle, WA area. Greetings everyone! This was quite a busy week for me, so I was not able to blog and tweet as much as I would have liked to. However, I wanted to leave one nugget of advice this week for those in higher education, although this might help those in primary and secondary education as well. Often times, we are so caught up in our work for the week, especially in the education field, we forget to learn and grow as educators. As an educator, I like to make a habit of learning something new every week. However, how do we make time to do that? Introducing the news aggregator! Several news (or RSS) aggregators have existed online for several years. Most recently they have evolved into apps. However, I prefer Feedly since, in my opinion, it is the most clean-looking of the news aggregators and it's free! 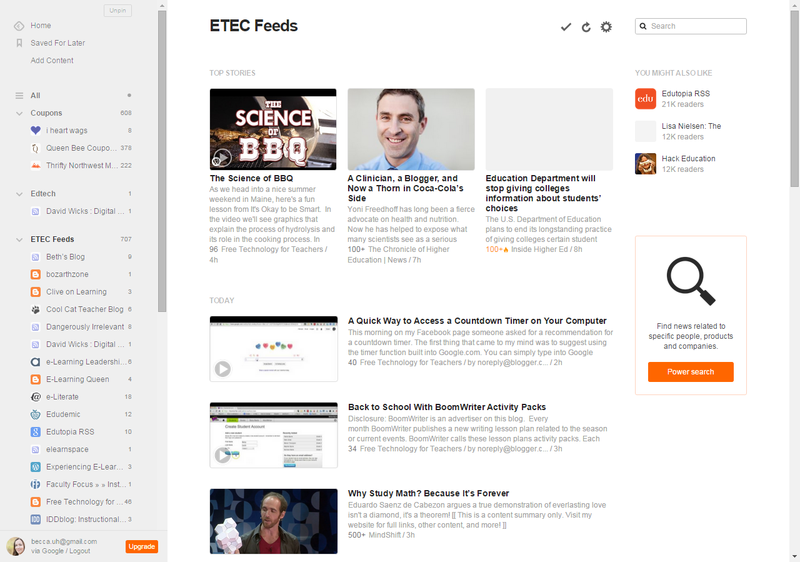 How Feedly works is it allows you to create lists of blogs and news sites that you want to follow. Every time a blog or news site adds a new post or article, the title of the post and a brief preview of the content appears on your Feedly page. By visiting your Feedly page, you can briefly scan new posts regarding your favorite topics and quickly learn about new discoveries or insights into the topic of your choice. If you want to learn more about a particular post, you can click on the title of the post to read the full post. Thanks for sharing this useful blog. Teacher can also enhance their skills by doing some IT Certifications like https://www.vceexamstest.com/microsoft-real-questions.html to improve their competency. Dr. Rebecca Meeder. Simple theme. Powered by Blogger.